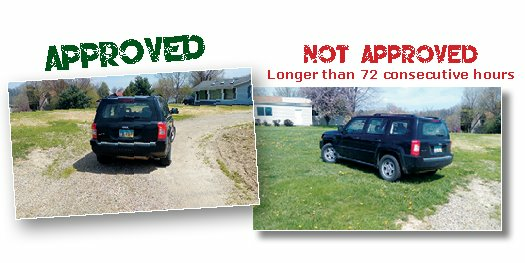 In order to maintain compliance, trailers, vehicles and boats MUST be parked in a driveway or over a gravel area designed to fit them. Miscellaneous items found in bylaw 17.3 must be removed from the lot. 17.2. No vacant lot shall be used for the storage (long or short term) of camping trailers, motor homes, watercraft, specialty trailers, utility trailers or other vehicles of any type. Designated storage areas/facilities must be used for storage or parking of such vehicles. No unimproved parking areas or yards shall be used for vehicle parking for longer than 72 consecutive hours. No common areas may be utilized for any commercial or nonresidential purposes, including but not limited to, parking for real estate sales or promotions. 17.3. No lots shall be used or maintained as a dumping or burial ground for rubbish litter, including but not limited to garbage, trash, waste, rubbish, cans, bottles, wire, paper, cartons, boxes, automobile parts, furniture, glass or anything else of an unsightly or unsanitary nature.